For those looking for the best tablet to buy right now, you've come to the right place. 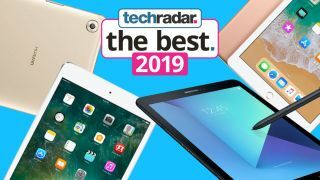 We're reviewed and ranked all the latest slates to bring you our best tablets list, helping you find the perfect device. The best tablets available today are ready to be part-time laptop replacements for plenty of people. At the least, this means a nice keyboard and software features you’d find on desktops or a traditional laptop. They have to be portable and light, yet powerful enough for your workflow. Update: We've now got the iPad Pro 12.9 (2018) in, and we're putting it through our in-depth review process. Will it make it into our best tablets round-up? Check back in a couple of weeks to find out! Apple's iPad Pro with iOS 12 (and soon, iOS 13) takes the lead thanks to its strong app ecosystem, but there are some incredible Android tablets, too. None have Android Q just yet. The best Windows tablet also makes a showing on our top 10 tablets list. Our tablet rankings are based on several geeked-out factors including performance, battery life and screen quality, though price plays an all-important role in the final verdict. This means some tablets that are better on paper, like Samsung Galaxy Tab S4 over the Tab S3, are dinged for offering less value. Here's a list of the best tablets you can buy today, though new contenders can (and do) shift our rankings. The iPad Pro 11 is the best iPad you can buy right now. It may be expensive, but it's Apple's most powerful tablet and furthers the 2-in-1 design ethos if you spring for the pricey new keyboard cover folio. It has a laptop-like experience in design and performance, and the new Apple Pencil magnetically clips onto the frame of the new iPad Pro. With superb speakers and a great new screen-to-body ratio, it's hard not to fall in love with the finely crafted hardware design. Another strictly mobile challenge: it doesn't have a headphone jack. If you want the standard 3.5mm jack in a computer-like device, you'll spring for an actual computer. Everything about the iPad Pro 11 makes it the best experience if you're looking for the best Apple tablet - you'll just need to swallow the high price - but it's no MacBook replacement. This is the best tablet for the average consumer and for education, even if it isn't the most powerful one on sale. It's simply a great value. The new iPad (2018) replaces the very similar 2017 model and, before that, the iPad Air 2 in Apple's lineup, slotting in below the Pro range. It works with the Apple Pencil, offering you the cheapest way to doodle on the 9.7-inch glass, though you can't get the Smart Keyboard with this non-Pro model. It also has the same luxurious metal unibody as the rest of Apple's iPad range, though notably it's ever-so-slightly thicker than the iPad Air 2 or iPad Pro at 7.5mm. With the Touch ID fingerprint sensor included, iOS 12 under the hood and up to 10 hours of battery life when web browsing or watching videos, it's a great media player and a strong tablet choice if you're not planning to use it heavily for productivity. We really like the iPad Pro 12.9 for its large size and it's the closest thing we have to a 2-in-1 touchscreen MacBook. It just happens to run iOS 12 instead of macOS. It's the best productivity and entertainment tablet around thanks to its 12.9-inch screen, four speakers and the iOS 12 dock and multitasking interface. Apple has redesigned its Control Center interface to make app switching even easier, and this tablet is compatible with the Apple Pencil and Smart Keyboard. It's biggest weakness? The iPad Pro 12.9-inch price, and the size isn't a good fit for everyone. But If you can afford it and want the largest-sized iPad available, you're going to love this – it's a laptop-replacement for a lot people out there. We really like the idea behind Samsung Dex for its desktop interface, but it's non-touch-friendly UI, performance issues, and questionable optional keyboard case prevent it from being a true desktop replacement. If you're looking for a premium Android tablet the Galaxy Tab S4 tops the billing, but it promises more than that and just doesn't deliver on everything. Don't get us wrong, the Tab S4 is indeed better than the Tab S3, but the value just isn't there for the money. It lacks the Pro features of a keyboard or Pencil support (the latter would be really nice to have on this smaller display), but overall it's got a decent screen upgrade and more than enough power to enjoy every day. The iPad Pro 10.5-inch is one of the best tablets for anyone who wants a serious upgrade, even though the cheaper iPad 9.7 remains good enough for most people. Apple's iPad Pro 10.5 has standout features that give it a productivity boost, including Apple Pencil and Smart Keyboard compatibility. With iOS 11 on board this tablet is even a suitable laptop replacement for certain consumers. The new ProMotion screen adds an impressive layer of fluidity to daily use and the smaller bezels means you're getting far more display in a footprint not much bigger than the iPad Pro 9.7. It's an iPad for the professionals - but also one that media munchers will adore using. Can a tablet really replace your laptop or home PC? That's still up for debate, but the best tablet trying to make that happen is the Microsoft Surface Pro. We’re surprised Microsoft has refrained from calling this the Surface Pro 5, as it's a big upgrade on the 4 - although it is rather expensive, like many tablets in this list. It does a fine job with the full blown version of Windows 10, an integrated kickstand and optional keyboard attachment. Great for for creative professionals, students and everyday folks alike, this is a top choice and one of the best Windows laptops we've reviewed. The Samsung Galaxy Tab S3 may have been super-ceded by the Galaxy Tab S4, but with its lower price and more stable, simple approach it still comes in on top of the newer model. It has a HDR screen for the ultimate contrast ratio, four speakers that sound as good as those on all the iPad Pro models and there's an S Pen stylus that's included in the box. You won't get a free keyboard cover though, which if you buy on top of the tablet helps make it a good on-the-go productivity tool. The HDR-enabled 9.7-inch screen is also pretty useful, given that there are a lot of services out there using the improved quality - you can now get Netflix in premium color and brightness quality, for instance. With an iPad-like design, the Asus ZenPad 3S 10 is something of a direct rival to Apple's best tablets if you want something with an alternative operating system. The screen is sharp and bright, and the power is decent - if not a well-known chipset running things. It's worth noting it's running Android Nougat software though, and Asus has yet to tell us if or when it'll get the latest Android Oreo upgrade. The battery life and build quality aren't quite up to Apple's standards, but then again, neither is the price - a good option if you want a larger screen for less. It may have now been replaced by the higher tech new iPad (2018), but the 2017 edition of Apple's iPad product is still a great buy and if you don't want to spend much it's a great choice for your next tablet. You don't get to use an Apple Pencil with this slate, but it comes with a crisp 9.7-inch display and punchy A9 power. You can't buy it directly from Apple anymore, but we've still seen it on sale from third-party retailers in certain areas around the world. There's no 16GB model, with this iPad kicking things off at a more reasonable 32GB, and if you need more space you can always opt for the 128GB variant.